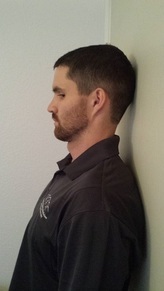 Directions: With your back against the wall, tuck your chin as if nodding "yes" to a question. While maintaining the chin tuck, lift your arms up to shoulder level keeping them forward away from the wall about 30 degrees on each side. Return to starting position.